It’s almost time for Columbus Craft Beer Week! 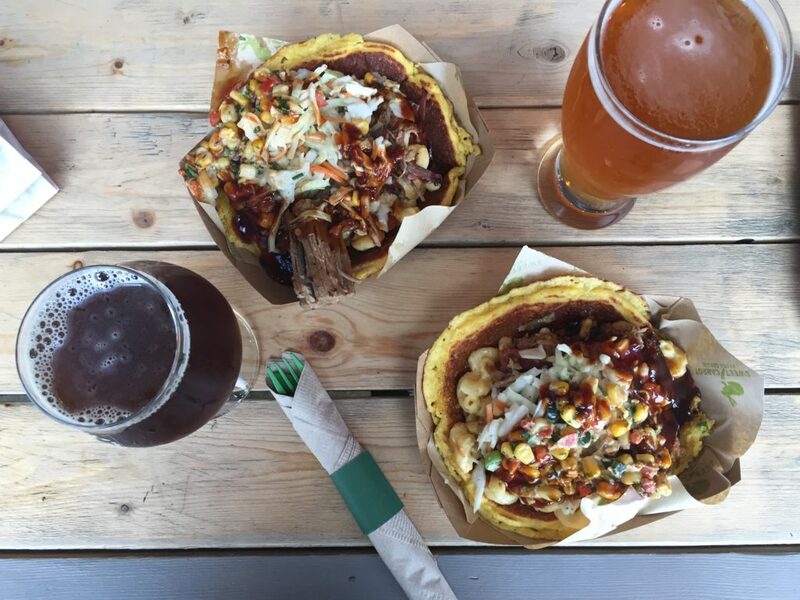 This extravaganza of all things brewery-related transcends the hops scene into something that celebrates the culinary arts and local businesses as well. The capital city has embraced its beer-loving roots; after all, we are home to over 30 breweries. Plus, we can boast about the Columbus Ale Trail and the fantastic tours offered by Columbus Brew Adventures. But May 12-20, don’t miss some of the unique opportunities to savor some Columbus-made suds. Learn more about all of the upcoming events here: http://www.columbusbeerweek.com/events/ and see you at Columbus Craft Beer Week! I’ll be writing more about this for the March newsletter (Click here to sign up for the newsletter), but this week Columbus Culinary Connection celebrated its 2 year anniversary! 131 blog posts, 4,200 Instagram (@cbusconnect) followers, and 8.3 million pounds of cheese later, I’m still enjoying being a food blogger. It’s forced me outside my comfort zone in tasting new cuisine, but also in making new relationships. It’s been a creative outlet, and given me a greater appreciation for Columbus and all things Ohio. I’ve enjoyed looking back at the posts I’ve written over the past two years, and daydreaming about the places I’ve visited, and of course the food I’ve devoured up to this point. Here are some of my absolute favorites! One of my very first posts, Rockmill is still a place that has a certain magic for me. 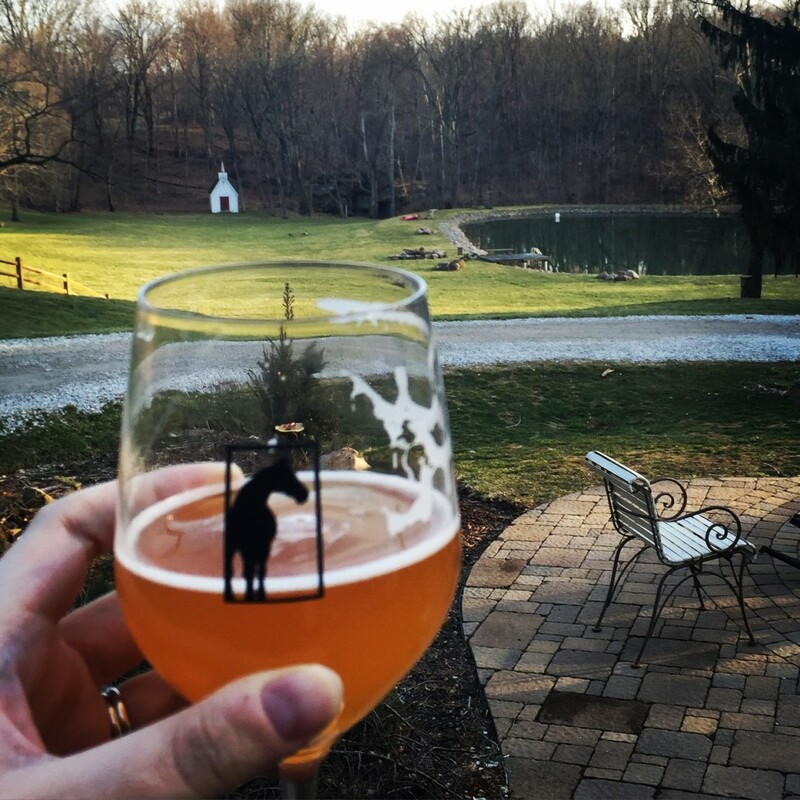 The countless good times on the brewery’s grounds and in the idyllic horse barn-turned-taproom make this a spot I’ll always go again and again. 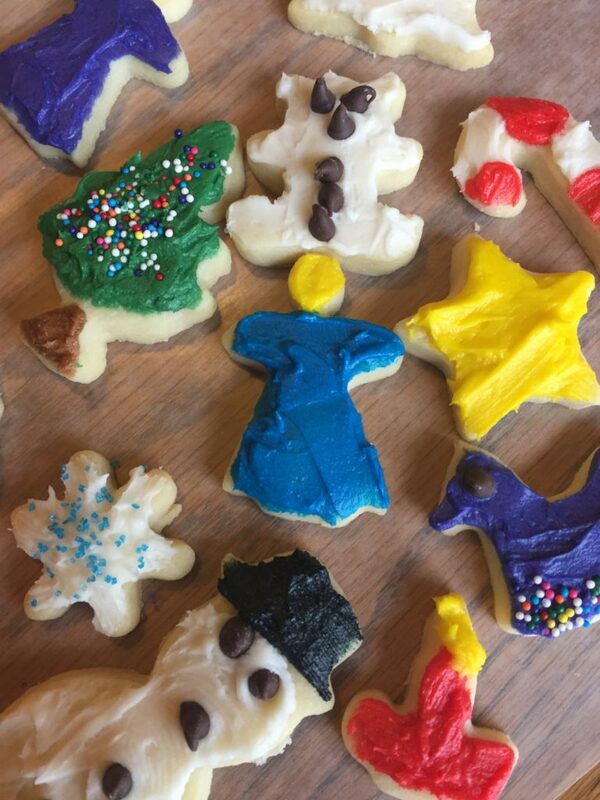 The original German Village location and the new Bexley Kittie’s cafe have some of my favorite treats in town. 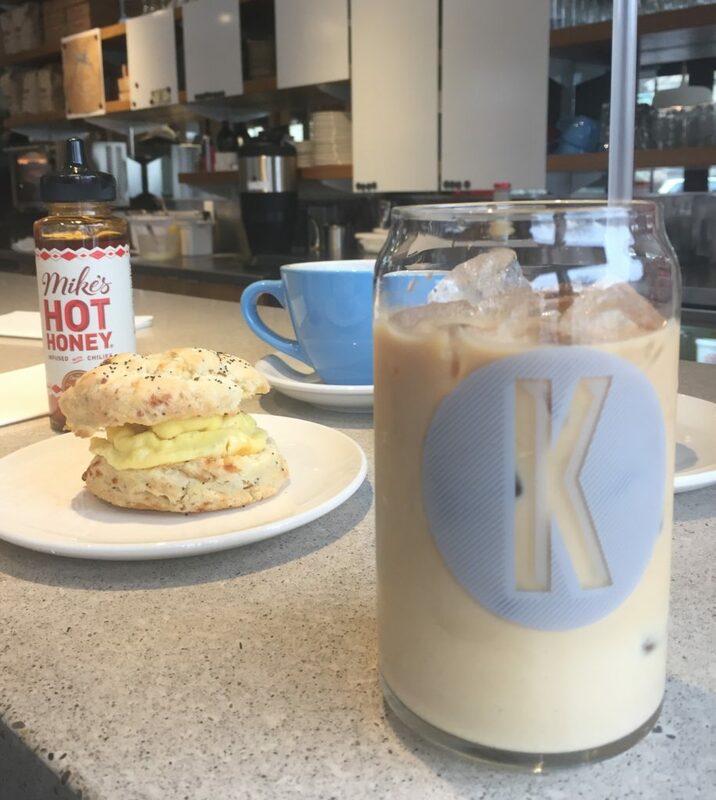 Bacon cheddar scones, immense Facecookies, and shop mascot Linus the Golden Retriever make Kittie’s a must-try bakery. 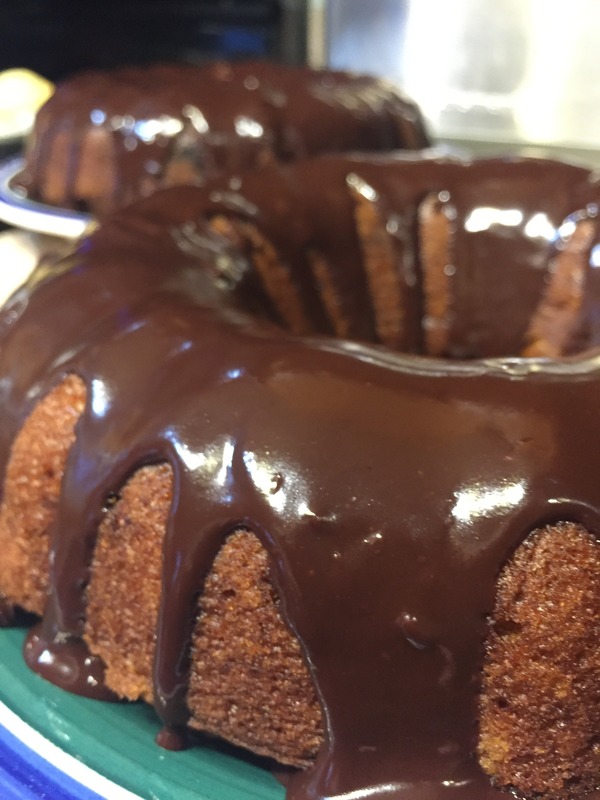 My mom was the guest writer for this post, and she’s the reason I am crazy about cooking. It’s one of my all-time favorite family traditions, and it’s been fabulous seeing so many other people take her recipe and incorporate it into their own holiday customs. I love exploring, and have embraced my inner history nerd. 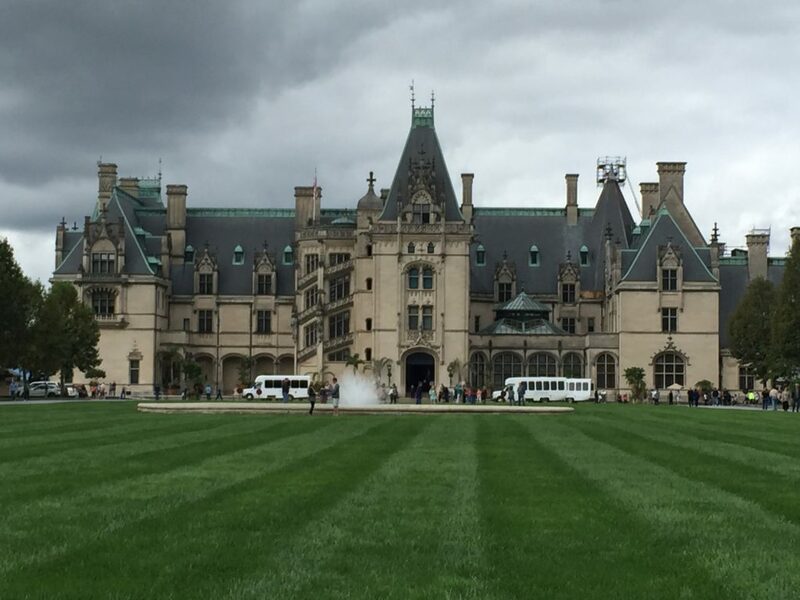 Our mini vacation to Biltmore Estate let me combine my admiration for both fine dining and Downton Abbey, and I loved every second of it. I also used this post as a template for my Charleston Gazette article, another writing opportunity that blogging has afforded me! The effort put into blogging is worth it soley because I learned about Fox in the Snow through blogger friends. What had I been missing? Only the cutest animal logo in town and some heavenly custard-filled donuts. 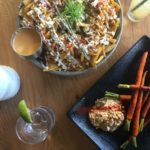 It’s been great seeing so many new foodie destinations pop up in Grandview recently, and there are some classic oldie but goodie spots as well. There’s something for every palette in this Columbus ‘burb. I need to get around to making another neighborhood dining guide soon. 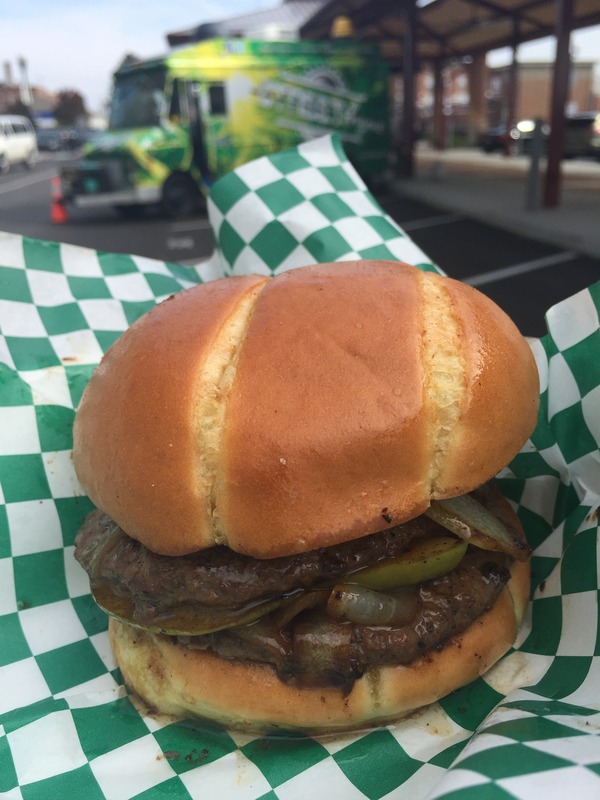 I love the ease and variety that food truck dining brings, and I tend to seek out my favorites time and again. Por’Ketta’s family business is doing some really fun things, and my adoration has not waned even after eating that chicken sandwich a hundred times. 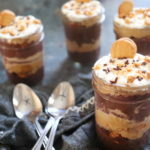 The secret is the cheesecake pudding! 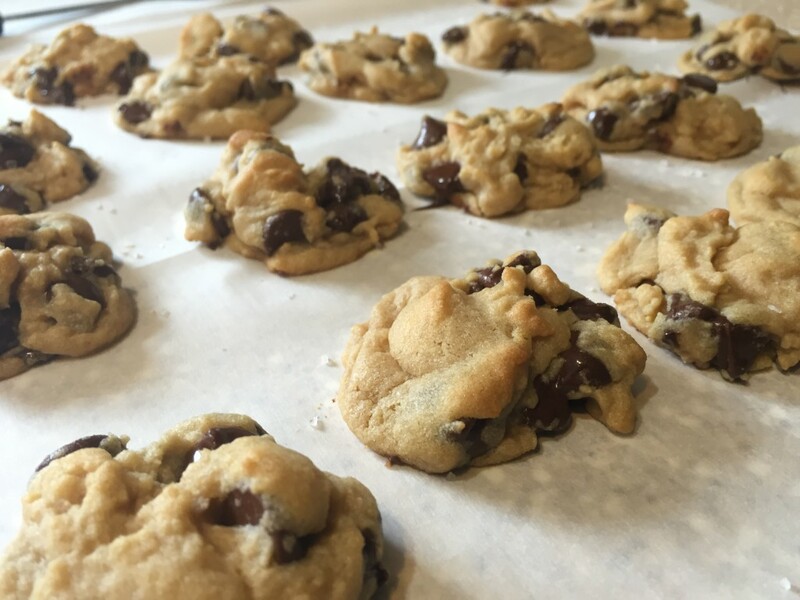 Trust me on this – it’s been my go-to chocolate chip cookie recipe for years. It makes the softest, tastiest cookies imaginable. I have to end this round-up with another round-up! 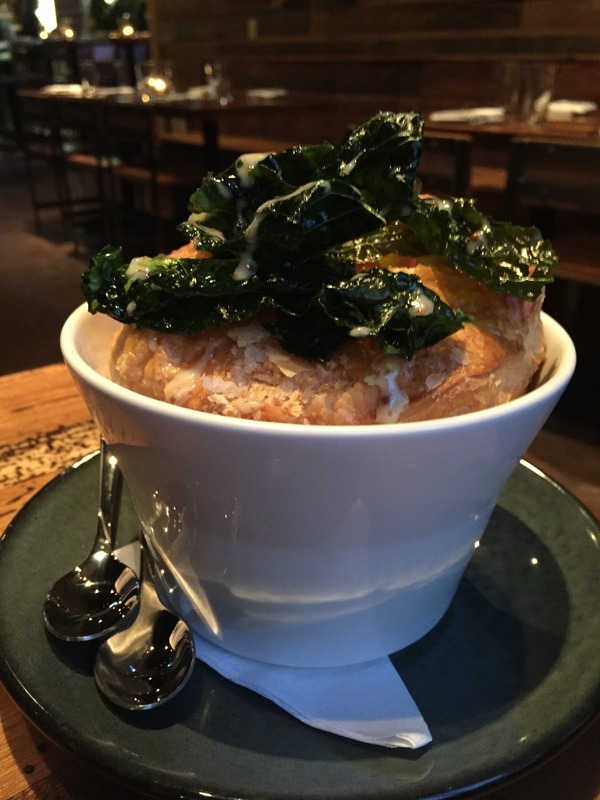 When you can list some of your most beloved restaurants in one cheese-laden post, i.e. 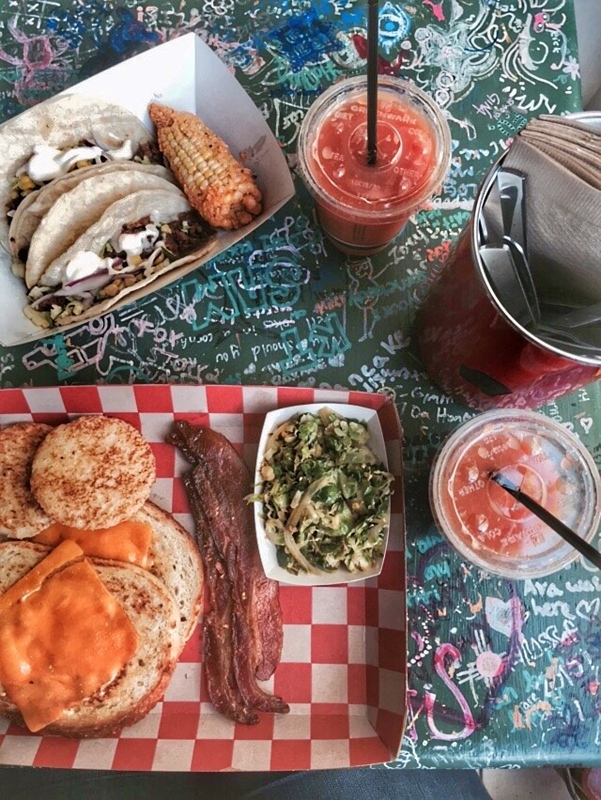 Hudson 29, Condado Tacos, and Bodega, what isn’t to love? I have a whole category on the blog of 5 to Try posts, when you’re in need of a quick reference guide. Thanks for being on this journey with me! Cheers to another year of bacon and blogging. You may have heard me mention the fact that I’m smitten with Blystone bacon breakfast sausage on social media (or bacon in general, for that matter). 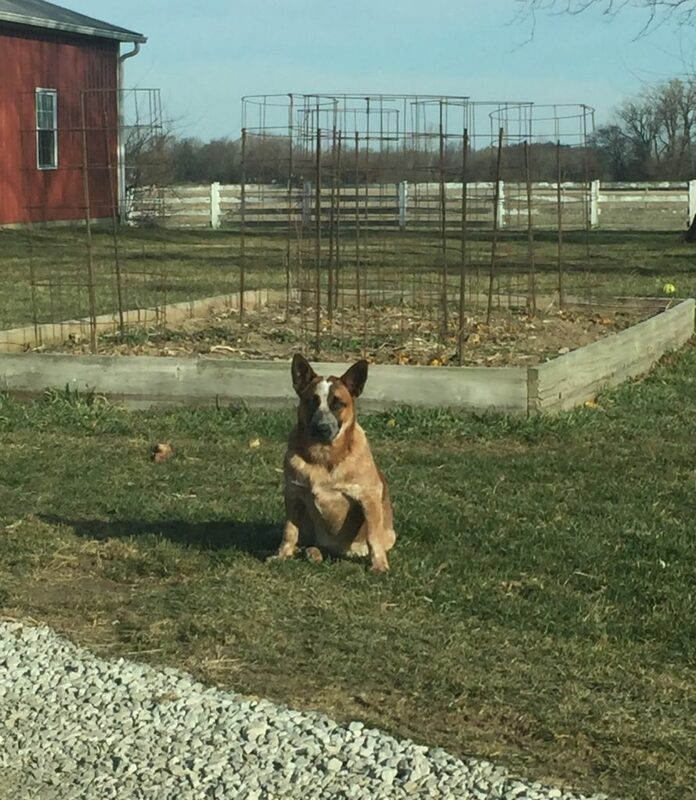 But the sausage patties aren’t the only things to drool over coming out of the Canal Winchester family farm. I grew up not far from Blystone, so I love to see this small business succeeding. The Blystone family is doing things right, recently adding a patio and a taproom area to the existing butcher shop and bakery building. 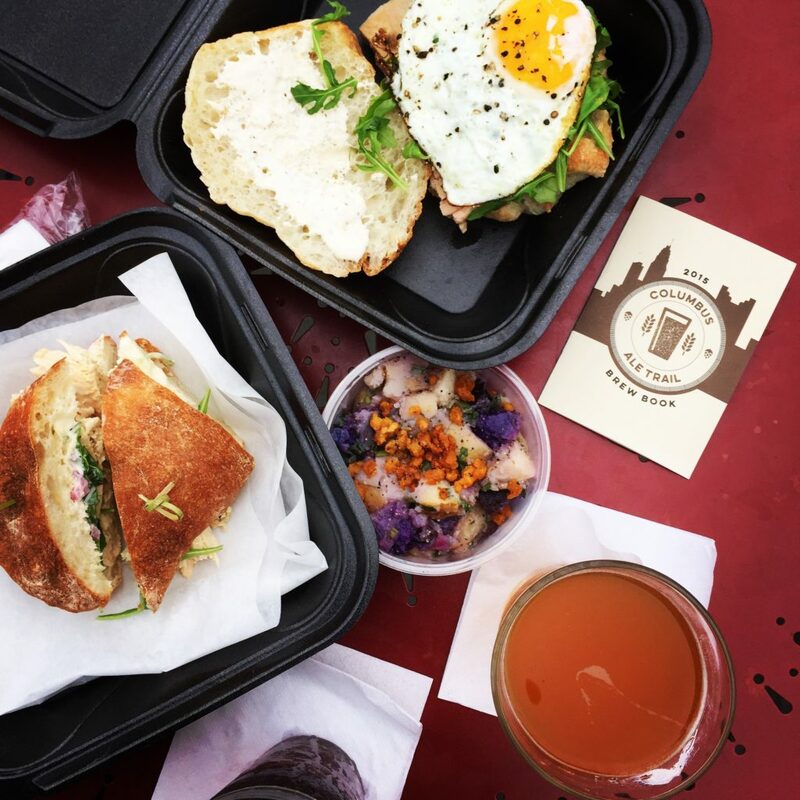 It’s now an ideal spot to grab a sandwich, sip on a craft beer, or pick up local products. 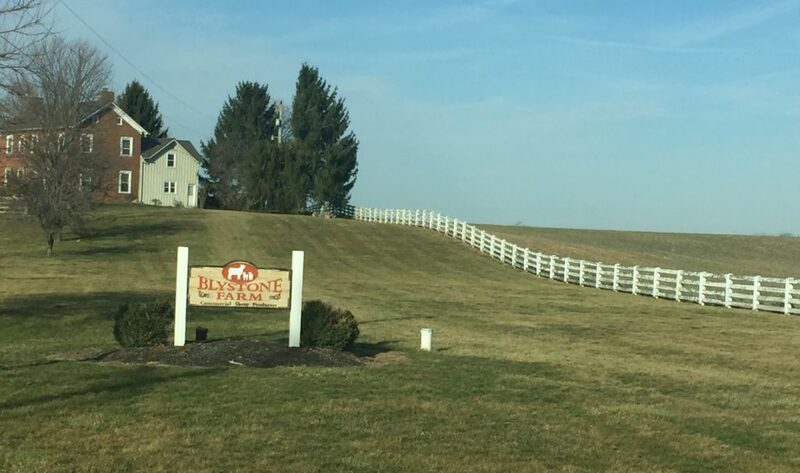 The whole operation is situated a few hundred yards from their homestead, and more often than not, upon pulling into the driveway you will be greeted by mooing cows in the pasture or the friendly resident farm dogs. One of them, Hank, even has his own Instagram account! The butcher shop works with many local purveyors to provide items like Dijon-marinated chicken thighs, bison, freshly ground beef, cut-to-order short ribs, and the infamous bacon sausage. 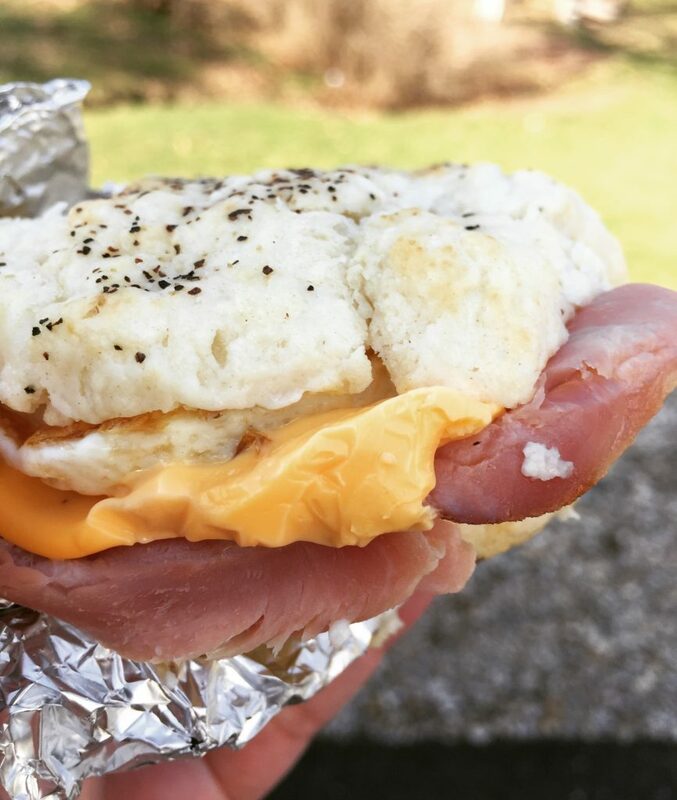 On weekends, they serve up breakfast sammies with your choice of their ham, bacon, or sausage, plus cheese and an egg, all on a freshly baked biscuit. For lunch, try a pulled brisket slider, a gyro, or a deli sandwich. Baked goods made in house are also available; think red velvet cookies and pecan sticky buns. The market portion of the Blystone business is a reason to visit in itself. 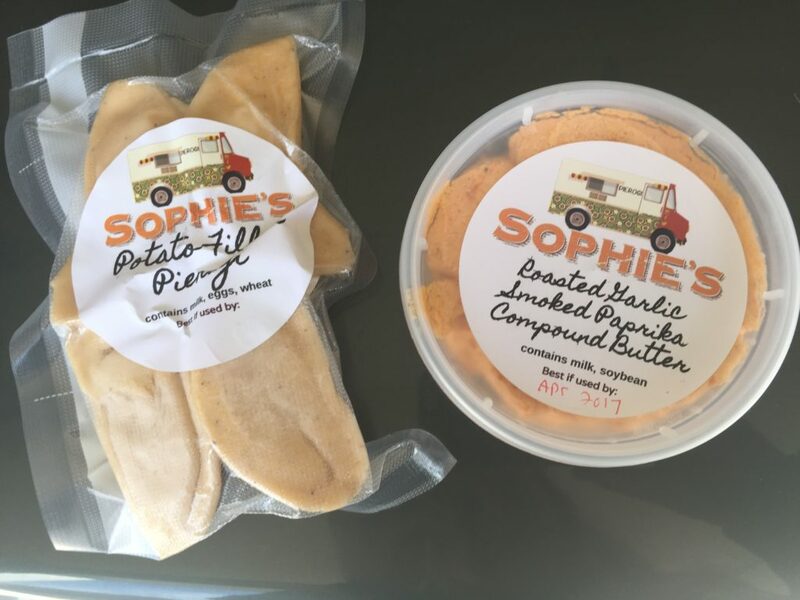 You can purchase food truck favorite Sophie’s Pierogies, frozen for you to sauté and enjoy at home. Or peruse the craft beer shelves, where you’ll uncover bottles of everything from Lancaster’s Rockmill Brewery to Columbus’ Wolf’s Ridge and perennial favorite Three Floyd’s Brewing. Other items I’ve ended up taking home? Maple syrup, salsa, caramels, local blackberries, and even Carfagna’s marinara. Journey out to Canal Winchester soon to visit the farm and Hank the cow dog! 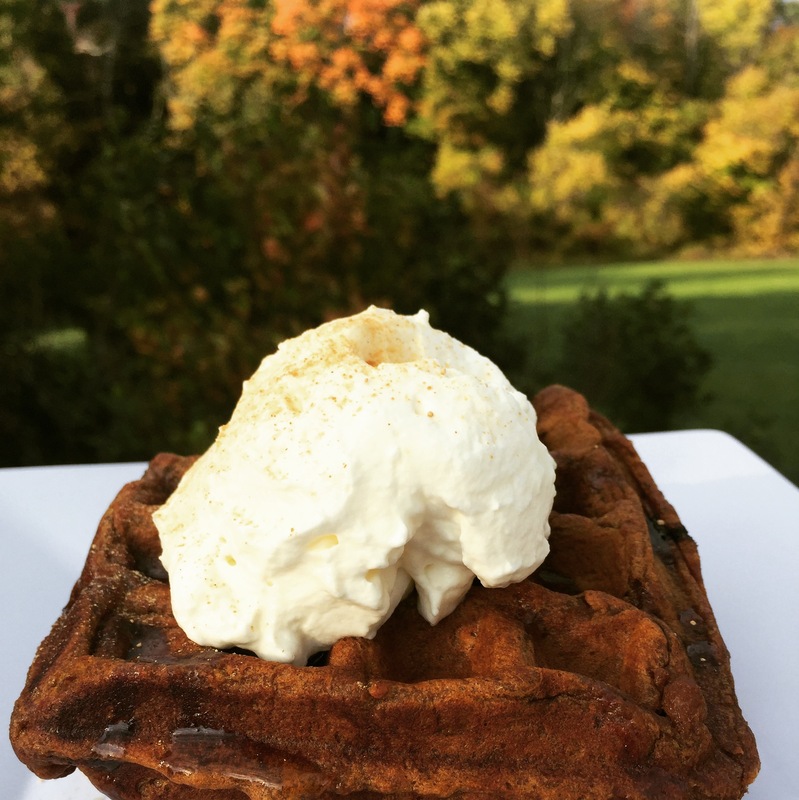 Culinary Clue: The farm is in close proximity to Slate Run Metro Park, and both places are very family-friendly. Make a day trip to the southeast side of town and kill two birds with one stone. With a Mexican-inspired focus and Salt & Pine’s Silas Caeton at the helm, this new venture can’t go wrong. The spot doesn’t open until early 2017, but you can bet I’ll be first in line. The pop-ups they’ve had around town have looked divine. 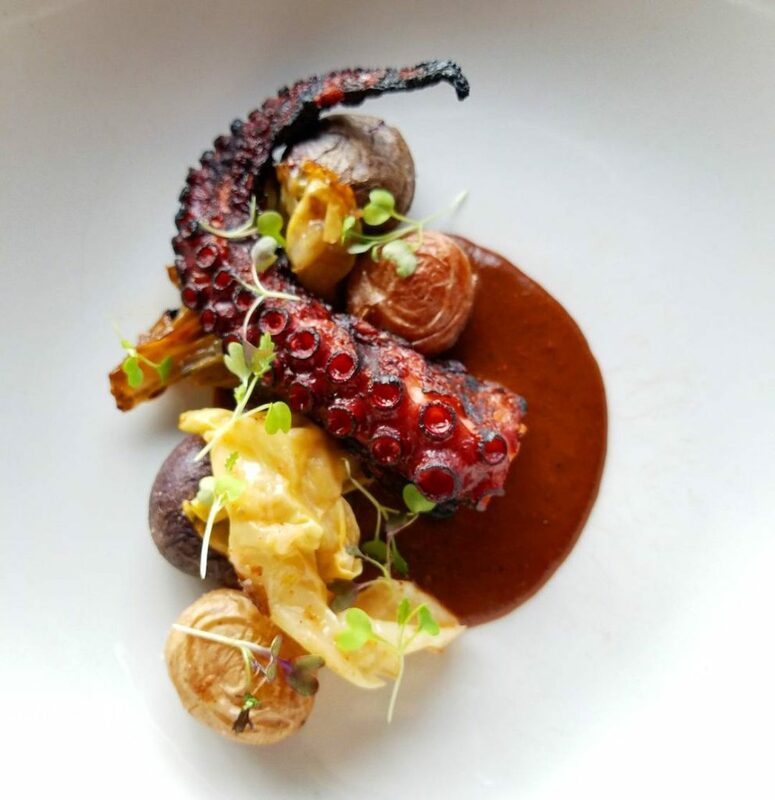 Pictured: Grilled octopus with mojo-marinated cabbage, red mole, and roasted taters. A fun twist on Thai ice cream rolls, these treats are hard to track down but the reaction from fans radiates positivity. A flavored cream base is poured onto cold stones, mixed with toppings, and scraped into pretty rolls. Catch them at a festival or pop-up near you! As a huge Cameron Mitchell cheerleader, I must be crazy for failing to eat a full meal at this Grandivew joint. The classic steakhouse interior always looks inviting, and I’m such a sucker for a well-prepared steak. Plus, they have baked cheese fondue. When melty cheese is on the menu, you must order it, end of story. Brunch is always a good idea, but when your diner of choice seeks out seasonal ingredients to create scrumptious-sounding comfort food, you can’t delay in visiting. I’ve got to visit Skillet in 2017, so I can gobble up entrees like quiche made with roasted butternut squash, kale, chevre, fresh thyme, and shallot baked in flaky pastry. This Reynoldsburg watering hole has been on my radar for awhile. The number one reason: a bruschetta bar! Mix and match varieties like Brie and apple with fig jam, burrata and bacon, or ricotta, dates, and pistachios sound heavenly, plus there is some great happy hour pricing on beer and wine. Where did I go wrong that I still haven’t made it to Paulie Gee’s, home of the mini pizza flight? 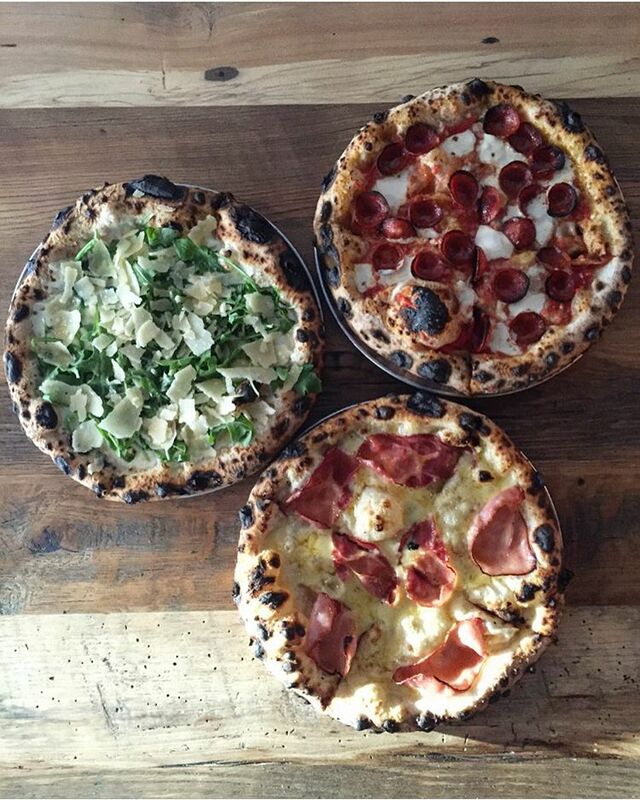 That’s right, no more confining your choices to one pie – you can devour 3! When the menu contains pizza combos like the Monte Cristo (Canadian bacon, gouda, maple syrup) or The Katzingers 83 (swiss, pastrami, sauerkraut, Russian dressing drizzle), I’m drooling already. A quick-service spot inside a beloved Japanese market, Tensuke Express cuts out the sushi and focuses solely on other delicacies. Dishes like ramen bowls, pork cutlet fried rice, and spicy shrimp udon make up the diverse menu, and I’m dying to try them all! The views of the new de Novo location look stunning, with large windows facing Columbus Commons and eclectic furnishings. The menu is intriguing as well – Duck BLT sliders, lobster mac, and kangaroo (!) too. I’m sold on noshing here next year! Did I miss any noteworthy restaurant you love? Tell me in the comments below. I totally get it: flavors like pumpkin and apple have become synonymous with the start of fall, and sometimes it can be overkill. But let’s face another reality: when all is said and done, we still find ourselves buying or ordering menu items with these ingredients because the dishes simply taste heavenly. So buckle up for a buffet of all the autumn eats I’ve enjoyed so far this season! 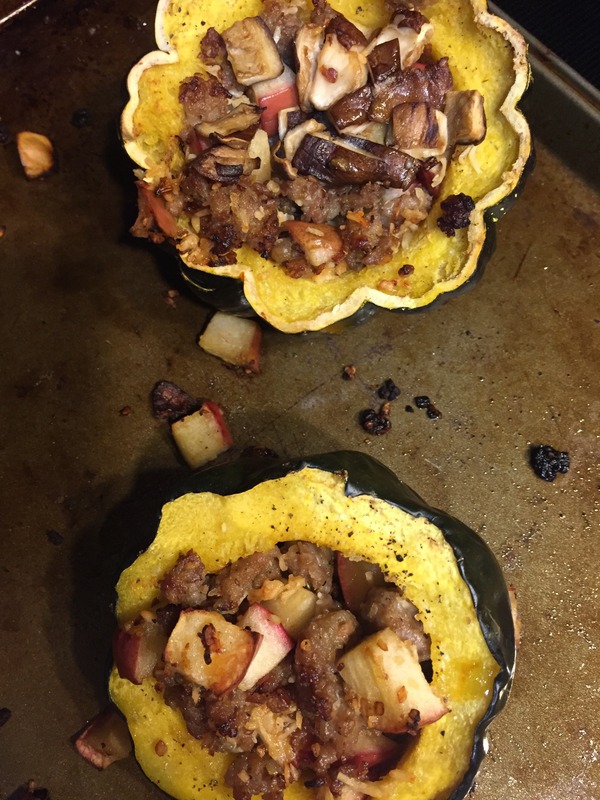 Don’t forget about squash, sweet potatoes, and warming spices too. 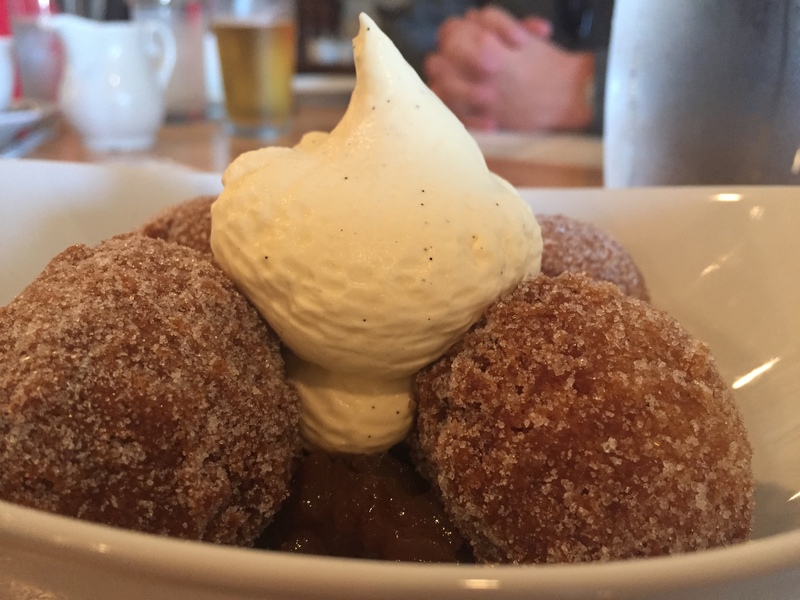 I wrote recently about how much I enjoyed my first Columbus Food Adventures tour, eating my way around downtown Worthington. So when Columbus Brew Adventures invited me to tag along on their Crafts and Drafts tour, I was raring to go. 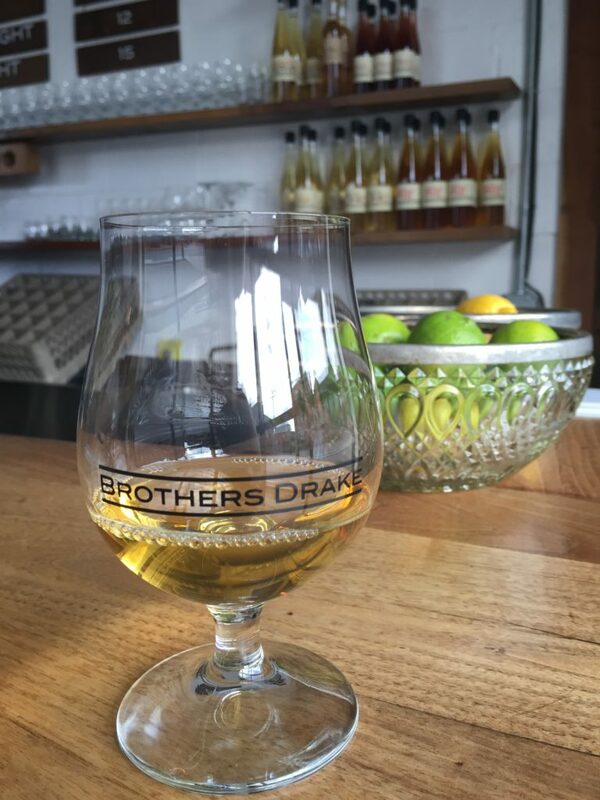 Even more so once I read the itinerary for this Craft and Draft tour: Wolf’s Ridge Brewing, Mad Moon Craft Cider, Brothers Drake Mead, and Watershed Distillery. This means tastes of beer, mead, cider, and liquor all in one day! As I’m a equal opportunity drinker, how could I not be excited about that level of variety? First, let’s talk about the logistics. We met up with our group of 11 at Wolf’s Ridge and were driven around in a CBA van to the various locations. Jim Ellison, founder of the CMH Gourmand blog and co-owner of Columbus Brew Adventures, served as both our driver and our guide, and offered plenty of nuggets of insight on the way. He also packed up our appetizers for snacking on the road and had a fabulous sense of humor, both additions that made the tour even more enjoyable! At Wolf’s Ridge, we received two of their signature munchies, potato chips and pork rinds. Having a base layer in your stomach was important, I later learned, because they weren’t shy with samples! We sipped on 4 different beers, including Pi, WRB’s smoked pumpkin brew, and a spice-infused imperial stout. Next, we strolled downstairs for a behind the scenes look at the bottling area and some of the experimental brews. I was pleasantly surprised to find that Wolf’s Ridge is working on creating some sour beers, that should be ready to roll out in a few months – woohoo! Next stop was Mad Moon Craft Cider, which was a totally different experience since they are still in the beginning stages of expansion. I’d tried Mad Moon’s Unglued caramel apple cider before, but quickly fell in love with owner Sally Moon’s tea and cranberry styles as well. Fall sangria with cranberry cider? I can see it now! Our group learned how hard it is to press apples into juice, in addition to being constrained by local apple demand, and subsequently I have a whole new respect for anyone who produces cider. We zipped over to Brothers Drake next, where due to a change in plans Jim gave us a brief tour of the mead-making area. Did you know mead is the world’s oldest spirit? I’d taken the Brothers Drake tour before, but I’m always glad to glad to sample the honey they use, as well as taste some seasonal varieties I hadn’t been able to get my hands on previously. 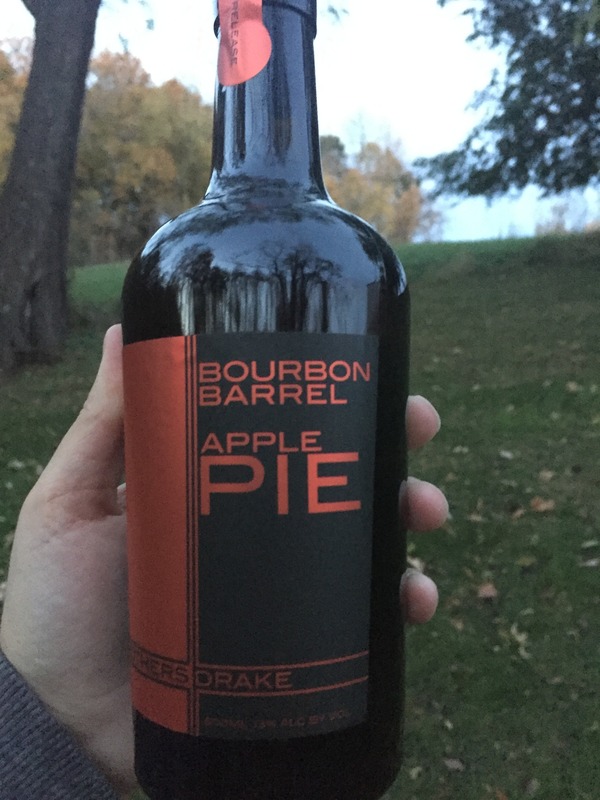 I’m looking at you, Bourbon Apple Pie mead. Watershed Distillery was supposed to be our final stop, but more on this later. Here, we got a quick overview of the liquor’s creation and its history. As a bourbon-lover, the Old Fashioned mix that Watershed churns out is heaven on Earth, and the bourbon barrel-aged gin could actually make me a gin convert. 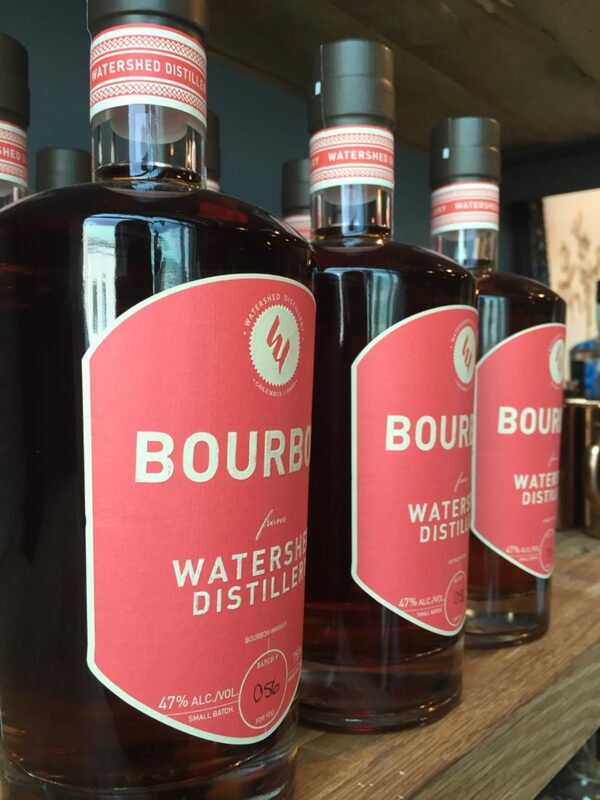 We also discovered that Watershed will be opening a restaurant as part of the distillery due to a recent change in Ohio law; this is exciting news in my book! With enough time remaining, Jim dropped us off at North High Brewing to pop in for a quick taster of a beer of our choosing. A mere 4.5 hours later, in much happier moods than when we started our days, we were delivered back to Wolf’s Ridge to conclude our afternoon. Taking this tour brought me to some of my favorite alcohol-laden spots in town, and helped me discover some new treats as well. I even learned some secret new tidbits at many of the locations, before the general public! There are plenty of other CBA options for boozy tours in the capital city if this itinerary doesn’t appeal to you. I’ve got to check out the Pitchers and Pizza one that hits up Hounddog’s Pizza (hello craft beer and Smokin’ Joe’s crust) but the Granville/Buckeye Lake beer tour sounds intriguing too. To learn more about the Craft and Draft tour and other Columbus Brew Adventures offerings, click here. PSA: A gift certificate to one of these tours would make a great gift for the adult-beverage lover in your life. 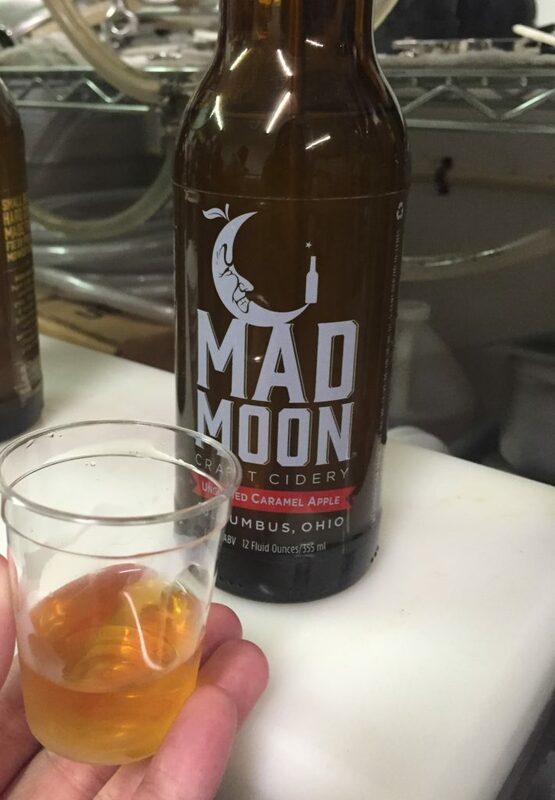 If you’ve taken a Columbus Brew Adventures Tour before, send me a tweet about the tour I should book next! 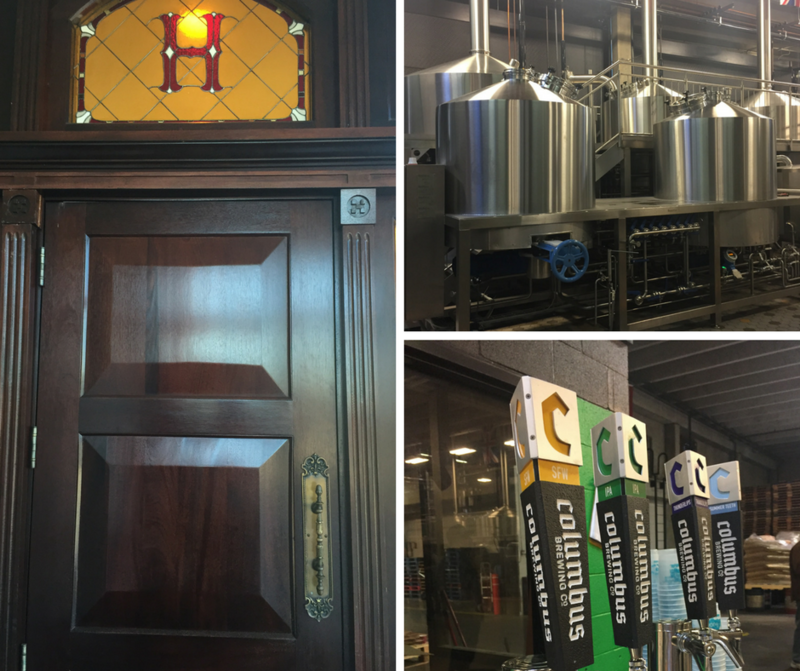 Disclosure: I was invited on the Columbus Brew Adventures tour. All opinions expressed herein are my own. If you follow this blog at all, you’ve probably picked up on my queso obsession. If I see a menu item with queso at any restaurant, I’ll probably order it; it’s not the fanciest choice, but it sure is delicious. 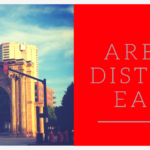 I feel as though there’s a lot of other people that share this passion with me, so I’m rounding up some of my top tastes in Columbus’ cheesy goodness here! The only thing that could possibly outshine Bodega’s diverse beer selection is liquid cheese, and you can find it in the form of their loaded fries. 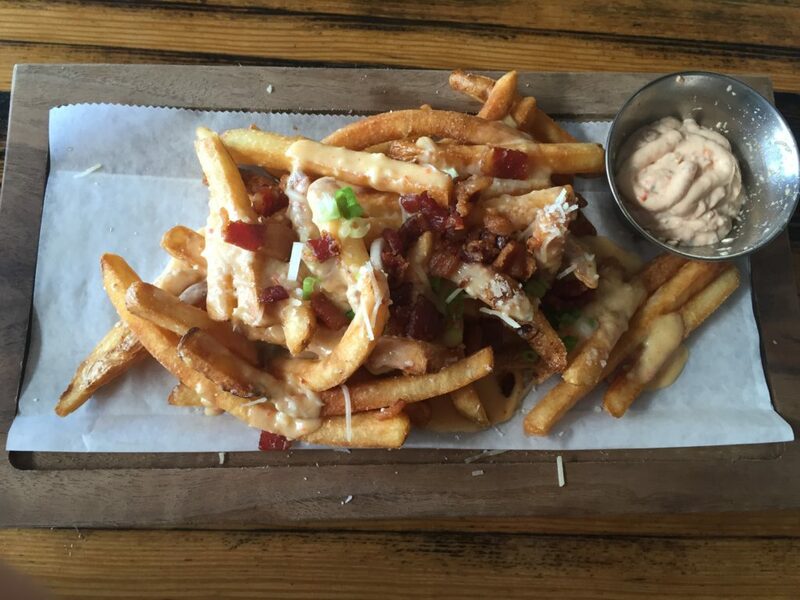 Think crispy fries topped with queso, bacon, scallions, and Parmesan, served with a fabulous tomato aioli. You will NOT want to share this starter. 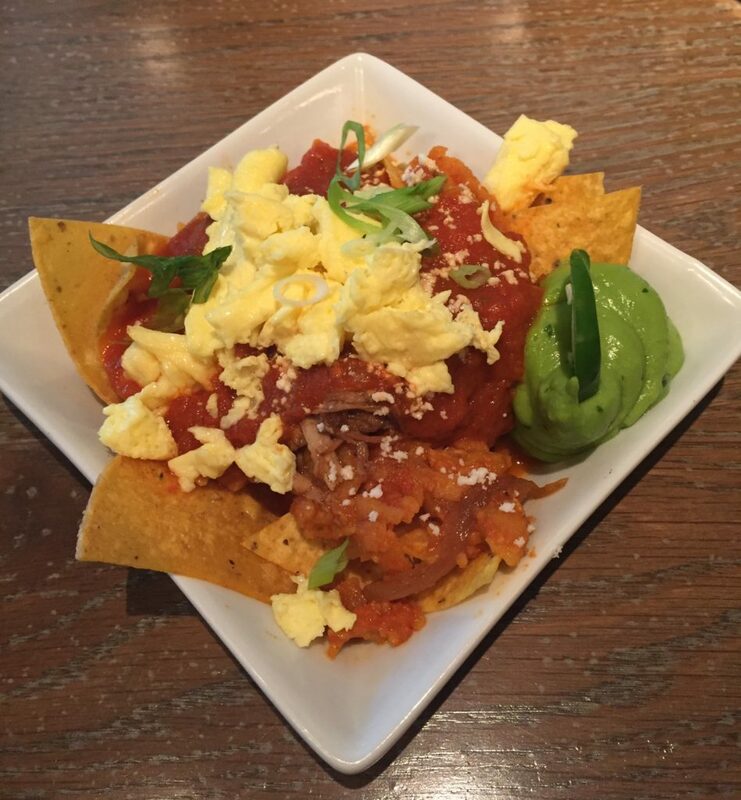 They also feature a queso-drizzled pork belly nacho app on their menu that you shouldn’t neglect either! The three dip sampler at Grandview’s Balboa highlights two other pretty scrumptious choices, but the only one you need to know about is the crock of queso. So creamy and savory you can eat it plain with a spoon, the generous helping of cheese could be your main meal if you wanted it to be! Wash it down with a signature margarita and your inner dairy-lover will be delighted! Heatseekers will love the Cameron Mitchell take on queso. With just the right amount of spice coming from the blend of cheese, chorizo, roasted peppers, and a touch of pico de gallo, this is a perfect happy hour snack for your table. At a more upscale restaurant this wouldn’t necessarily be your first choice, but this is not a dish that should be overlooked! I’ve shared about my husband’s Tortilla addiction before, but it’s the queso that I think really makes the nachos at this Columbus food truck stand out. Anyone can melt some shredded cheese on chips and call it nachos, but to have queso on there too is something special. 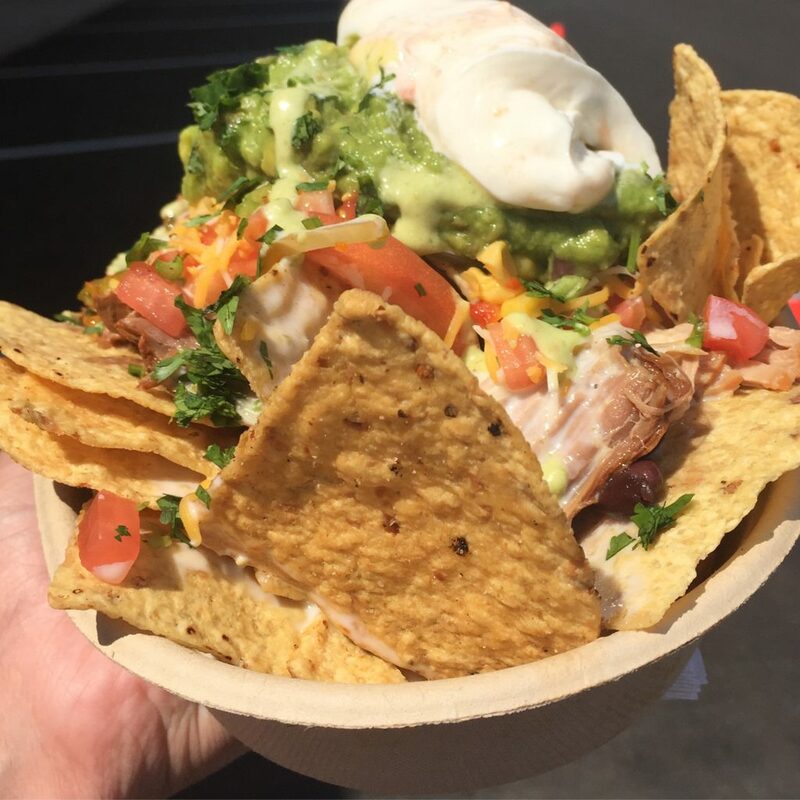 Who can resist the combo of guac, carnitas, salsa, and all your other favorites piled high with a ladle full of queso? 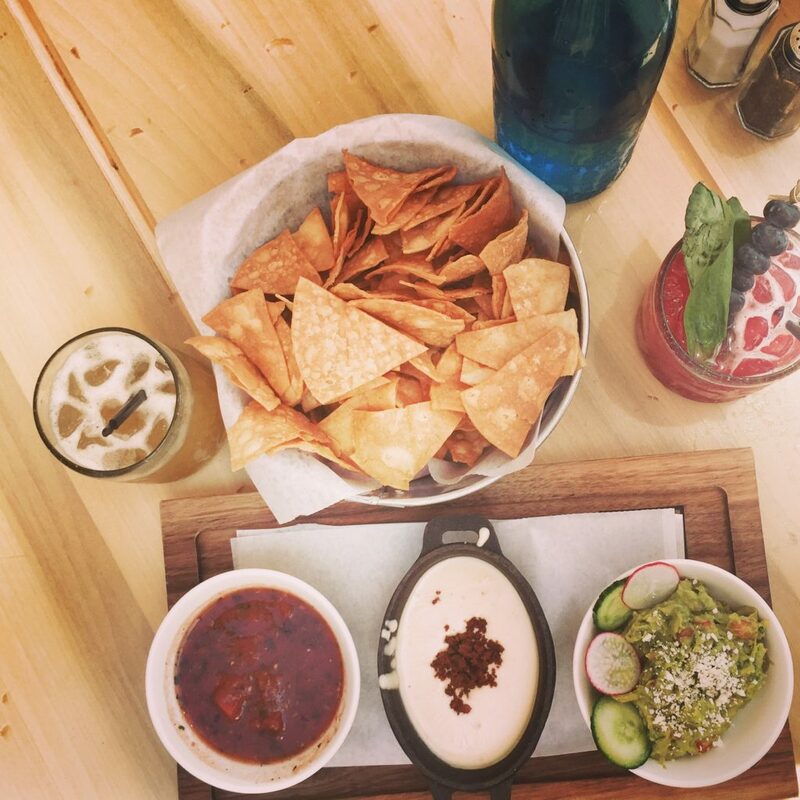 Like Balboa, Condado boasts a sampler platter of dips, but with an important distinction – you can get three kinds of queso if you choose! You read that right. Pick from varieties of guacamole, salsas, and queso to make the appetizer of your dreams. 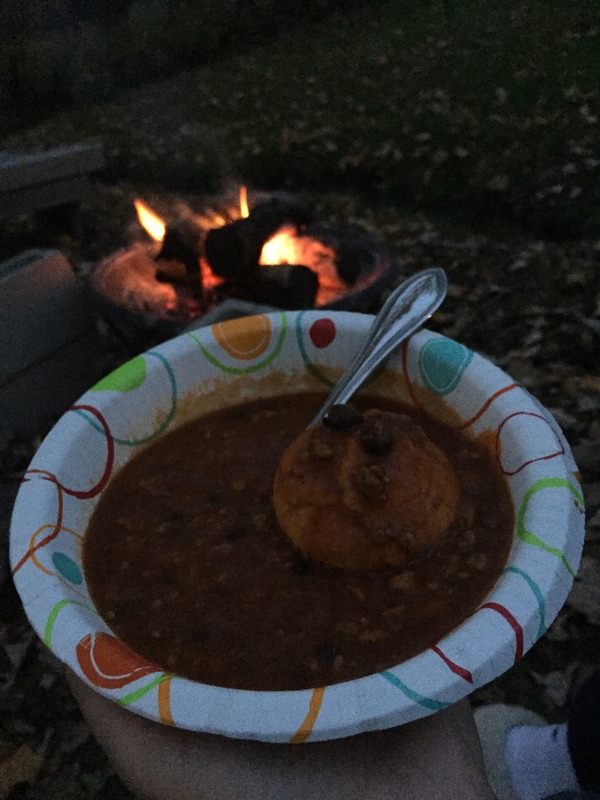 For the queso, there are original, corn with spices, balck bean, chorizo, spicy diablo, and “dirty” (chicken, onions, and secret recipe dirty sauce) options. You can also sandwich a hard and a soft taco with queso for an entree! Do you have a favorite spot in town to get your cheesy fix? Send me a tweet (@cbusconnect) and let me know! I’ve been dying to see my city through a Columbus Food Adventures Tour, so when one of my out-of-town friends came to visit, it was the perfect excuse to take the plunge. I chose the Worthington tour because it was newer, so I knew we’d see some spots I’d never visited yet, plus I loved the idea that there were some history tidbits on this itinerary. It didn’t hurt either that The Whitney House is one of my favorite restaurants in town, and I knew we’d be heading there! Our group met at the Candle Lab, which was a good place to increase your hunger for the tour by inhaling candle scents like lemon and cinnamon. We then headed outside into the depths of the Farmers Market. The time our tour began was at the tail end of the market, so crowds were starting to die down. 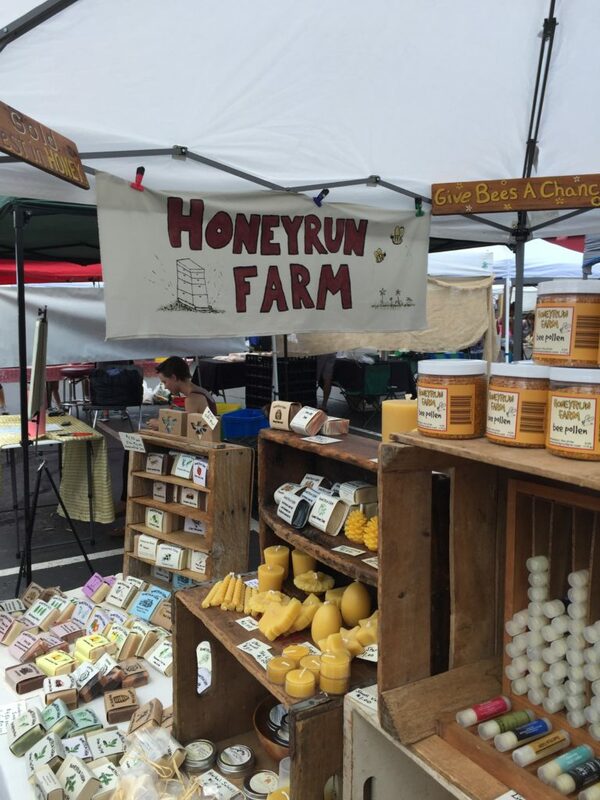 From Honeyrun Run Farm, we compared and contrasted the flavors of 4 different honeys. Next, at Blue Jacket Dairy, we gobbled up garlicky cheese curds and feta, as well as sampling some freshly grilled cheese – those slightly burnt, crispy edges were divine. Our last market stall was another delicious cheesemonger, Kokoborrego. Stop 2 was a visit to House Wine, for a sample of rosé paired with more Blue Jacket cheese curds (hooray!) and crackers, in addition to three samples of North Country Charcuterie. North Country makes sliceable salami that are made with local products like Rockmill Brewery beer, and we learned about the process in making these delicacies. The owner of House Wine also spoke with us a little about their wine catalog, and gave some more details about the specific rosé we were drinking. 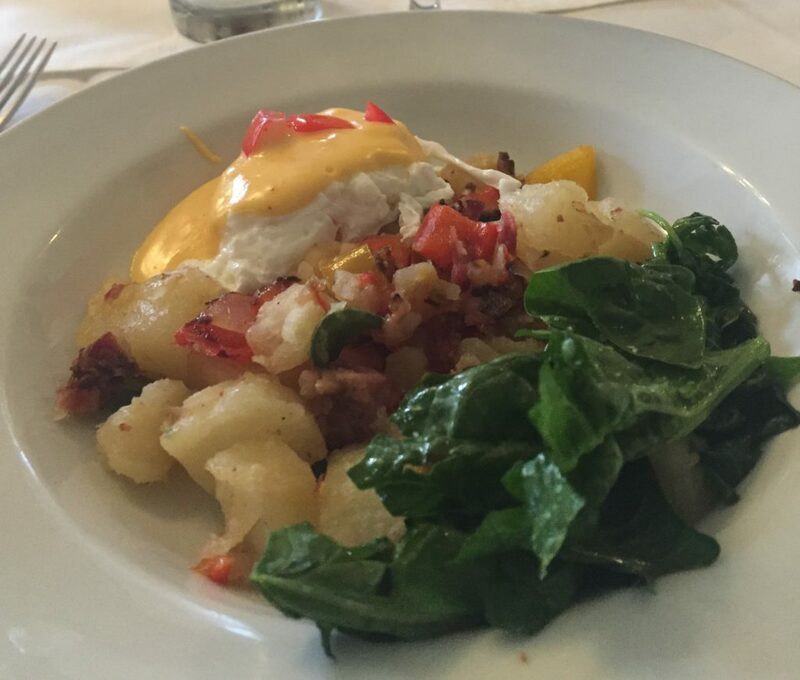 At Worthington Inn, we received an enormous “taste” of Worthington Eggs Benedict, a small mimosa, and a healthy dose of history. You’ll have to take the tour to hear the spooky ghost stories accompanying the meal – they are worth it! A brief walk to the following location helps give your stomach a break to make room for more goodies, before landing at the quaint and beautiful French café La Chatelaine. I’ll be back to try the pastries on display as they looked mouthwatering, but in the meantime we dined on mini tuna salad sammies on brioche and gazpacho. 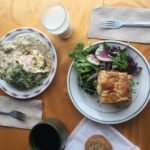 I’m obsessed with the donut muffins and the egg sandwich at Sassafras Bakery, but when we made our next break here I found some new menu favorites. The cherry pie was heavenly, as was the mini-scone laden with local ramps. Even the teeny dish of salad was tasty, and greens are so not my cup of tea. By this time, I was glad to stop at Igloo Letterpress for a short respite from stuffing my face. Igloo is a unique place for gifts, paper-printing workshops, and an all-around good time. We were lucky enough to print our own coaster on the old-fashioned press with a Julia Child quote, and the talented owner Allison shared some of her artistic creations and printing stories with us. With a final stop for chilaquiles (nachos with scrambled eggs, savory sauce, jalapenos, creamy guac, and more) at the always-excellent The Whitney House, our tour was complete and our stomachs were full. Overall, I have to say that I’ve done food tours in other cities, and with this one, you get a serious amount of samples! I was expecting 4 or 5 stops with tastes, but some of the locations pretty much gave us a meal, plus a small drink, and I wasn’t the least bit sorry about it. Furthermore, my inner history nerd loved learning about the founding of the city of Worthington, as well as some of the prominent residents. This would be a really fun thing to do with a group of friends or family too, because who doesn’t love eating? 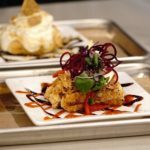 I highly recommend that both native Columbusites and visitors alike give Columbus Food Adventures a try – it’s a fun way to see a suburb you may not have examined too closely. 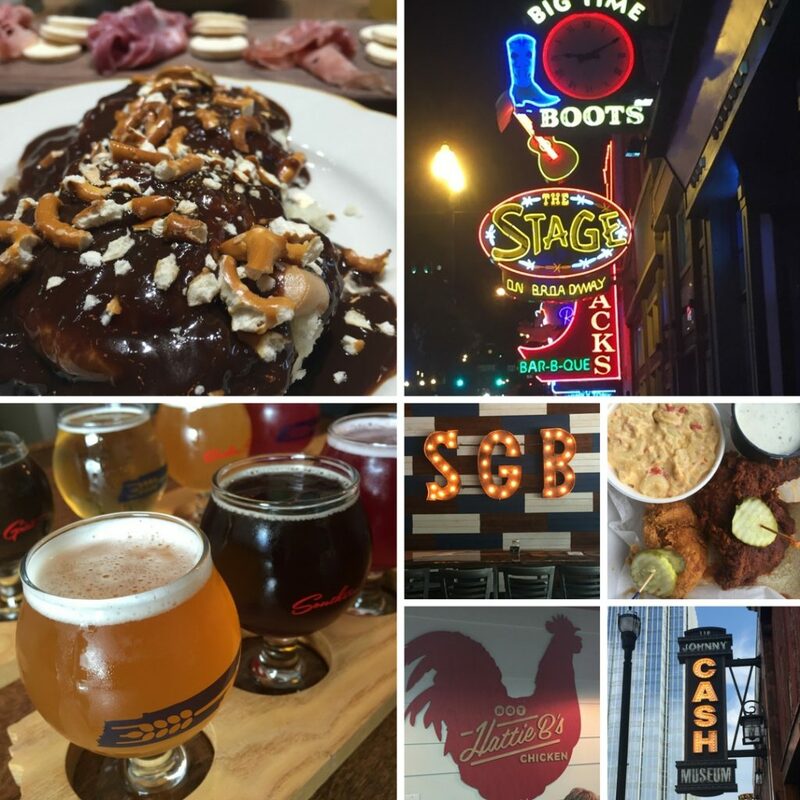 Neither my husband nor I had ever been to Nashville, so we were eager to scope out the local food and drink scene in the Music City. We ate biscuits in some form every day of our trip, and despite the heatwave, did an extensive amount of exploring! Below, you’ll find a collection of photos and the low down on our dining journey. The first stop was at Belle Meade Plantation, where we soaked up some history on a guided tour, followed by a wine tasting at the on-site winery. Wine and an antebellum home? My inner history nerd couldn’t resist! 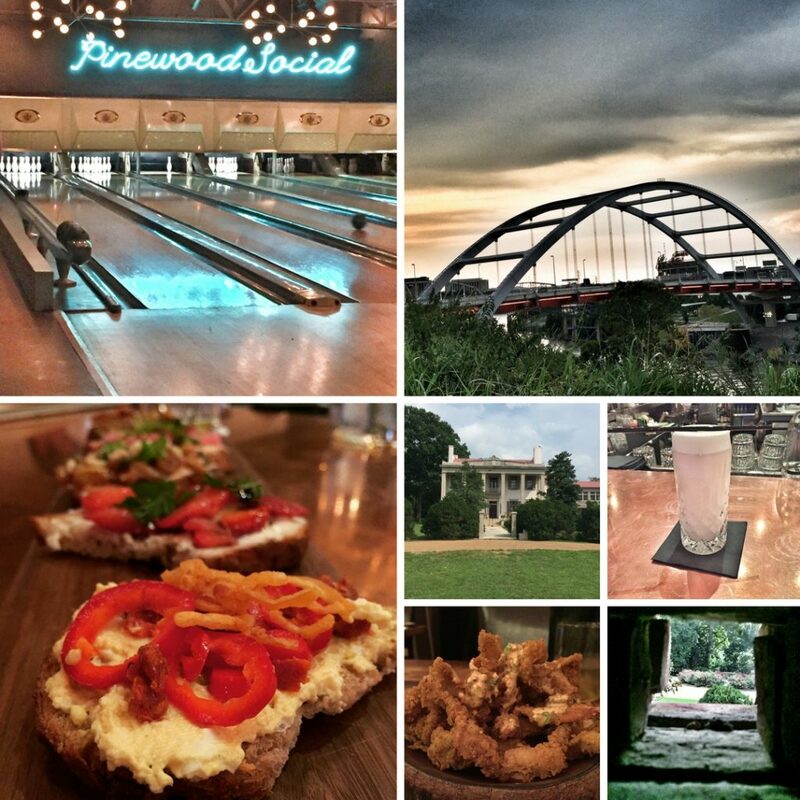 Afterwards, we headed to Pinewoood Social (on a Columbus Food Adventures recommendation) to observe some casual bowling and eat snacks. The toast tasting was divine, consisting of 5 mini crostinis topped with different goodies ranging from mascarpone + berries to deviled eggs, and the bartender made a perfect Ramos Gin Fizz. For dinner, we had to hit up Husk, one of my favorite restaurants in Charleston, SC. There’s no shortage of Southern charm here, from the decor down to the food. I am still swooning over the dessert, a twist on streusel coffee cake, and the fried chicken skin appetizer drizzled with white BBQ sauce. When in Nashville, checking out a hot chicken joint is a must. Sorry I cheated on you, Hot Chicken Takeover. 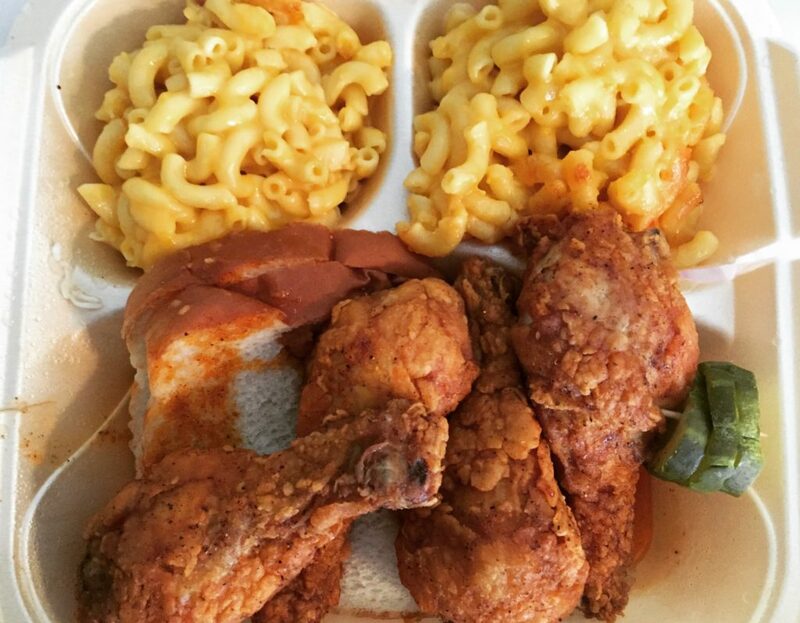 Hattie B’s delivered with perfect, cayenne pasted-rubbed fried chicken. Tip: call ahead to order so you can skip the round-the-block line! The side of pimento cheese macaroni was tasty too. 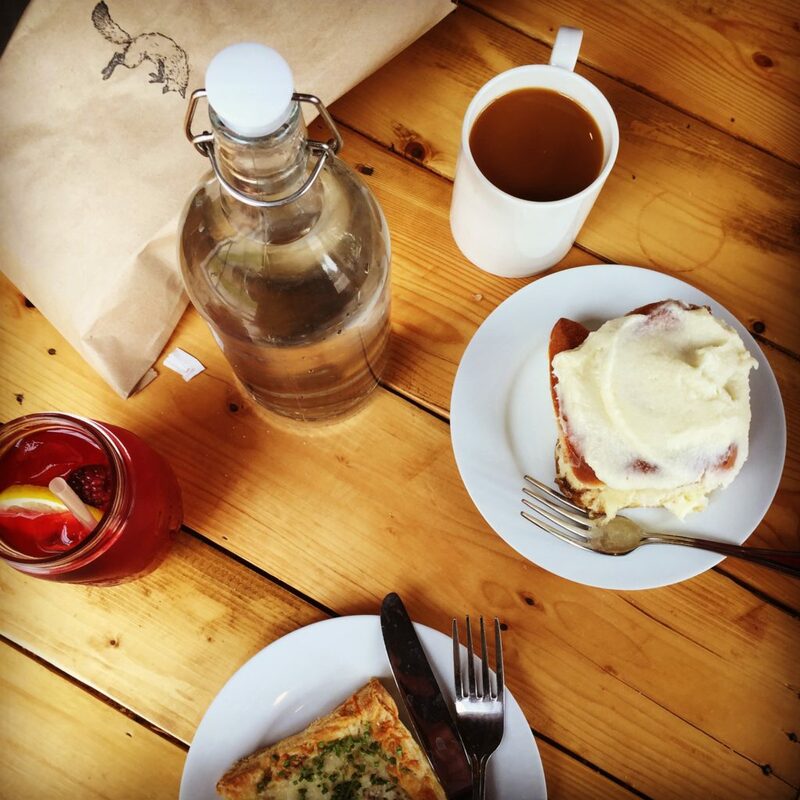 If brunch is your style, make sure to nosh at Biscuit Love. I can’t say enough good things about the menu. Think chocolate pretzel gravy on biscuits, bonuts (fried and filled biscuity doughnuts), and even a ham tasting platter – heaven! I love discovering new breweries on vacation, and Southern Grist Brewing exceeded my expectations. They specialize in sour beers, and we brought back a crowler of the Nashville Mule, a lime and ginger beer-inspired delight. At night, we prowled around the Johnny Cash museum and enjoyed some Broadway bar-hopping while listening to some ridiculously talented live music acts. Before heading out of town, we went to Centennial Park, a wonderful place to stroll. There is a really cool recreation of the Parthenon inside the grounds, as well as some beautiful ponds and landscaping. Breakfast was Barista Parlor iced coffees and you guessed it, more biscuits. Because how can you go into a cafe with sausage and egg biscuit sammies slathered in peach jam and not order it? Our final impromptu destination was Five Daughters Bakery, to buy some doughnuts to take home. These aptly named “hundred layer” doughnuts are more like croissants, in the best possible way. 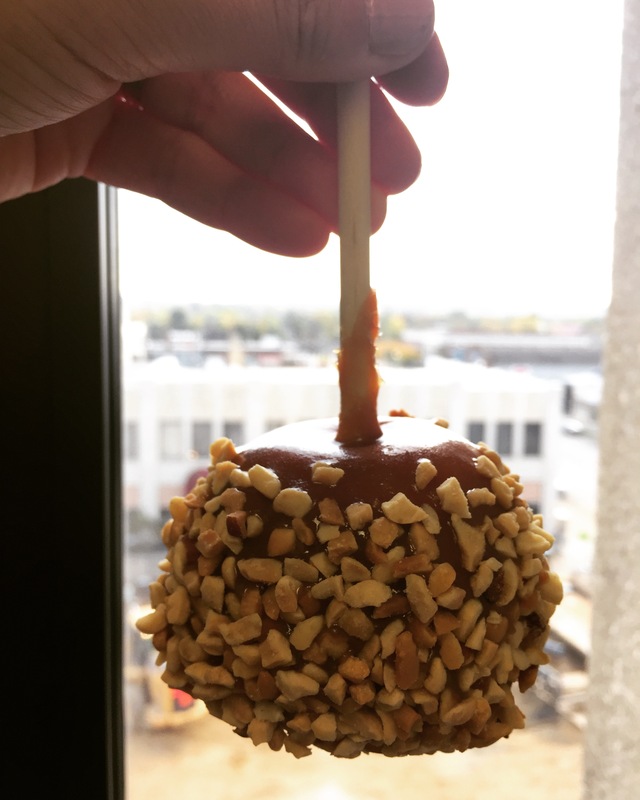 It’s a toss up as to whether the maple bacon King Kong variety or the peanut butter cup version was better, but I’d definitely devour either again. 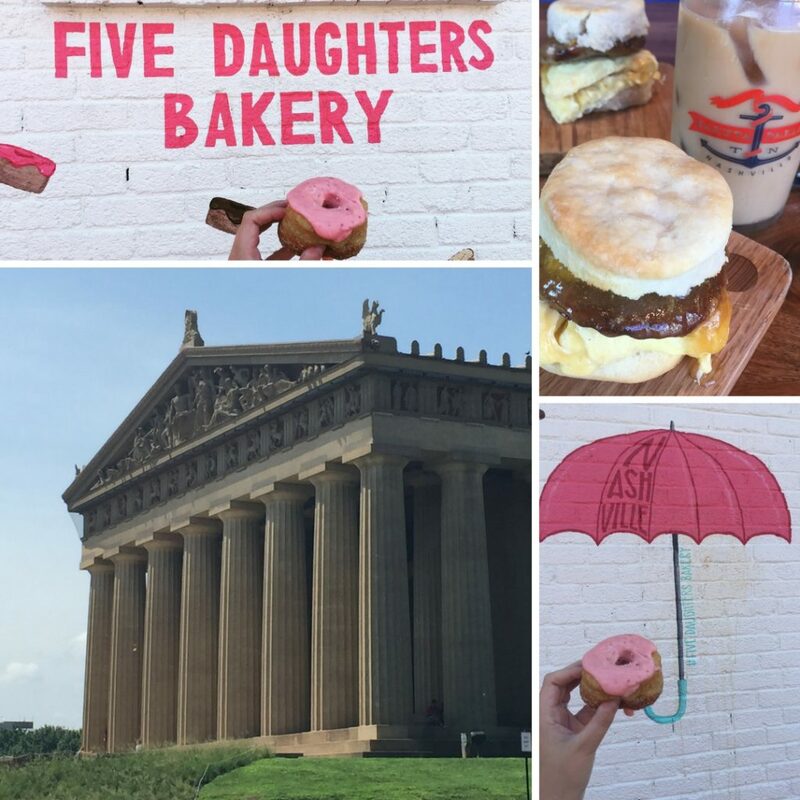 Nashville was a fun place to uncover some new food gems. Plus, I loved that there were so many Jeni’s Splendid Ice Creams around too; it felt like a piece of home. 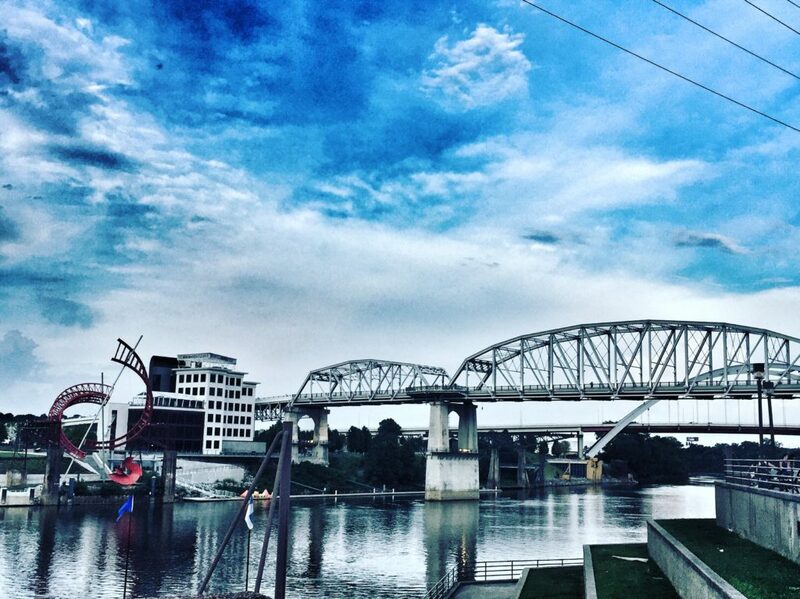 Where is your favorite place to dine in Nashville? Let me know below! 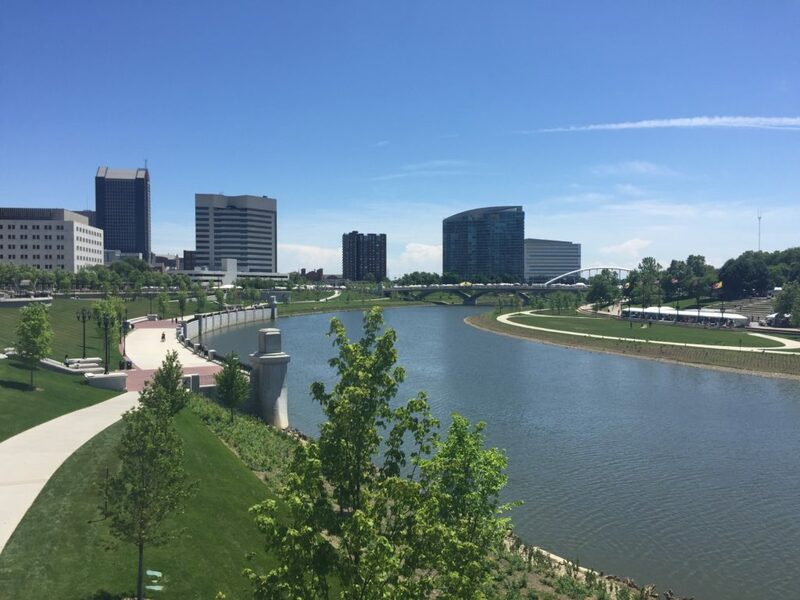 Ohio’s tourism slogan might be “The Heart of It All,” but the capital city of Columbus is quickly becoming the heart — and soul — of the state’s culinary scene. You can find this surprising dining metropolis just a quick, three-hour jaunt from Charleston, making it the ideal weekend getaway this summer. 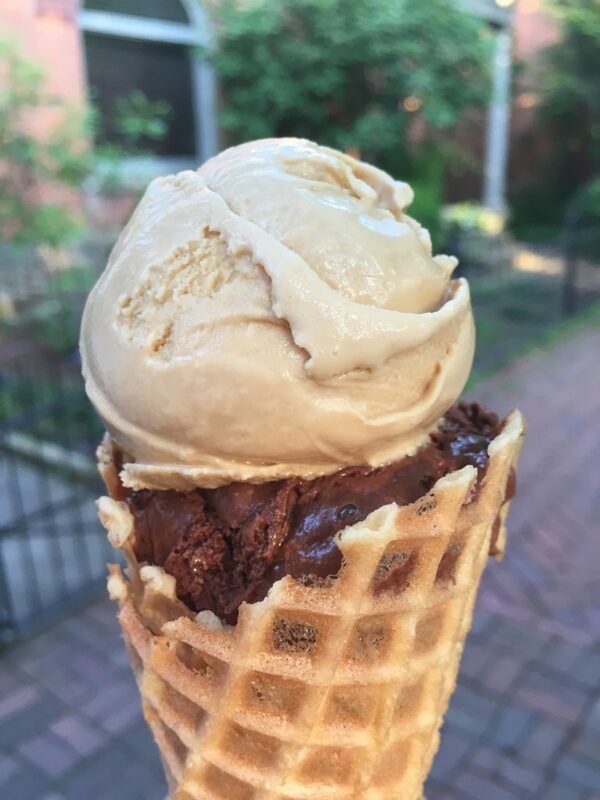 Columbus is a known haven for breakfast fanatics and ice cream enthusiasts, but there are plenty of options for every taste and budget. 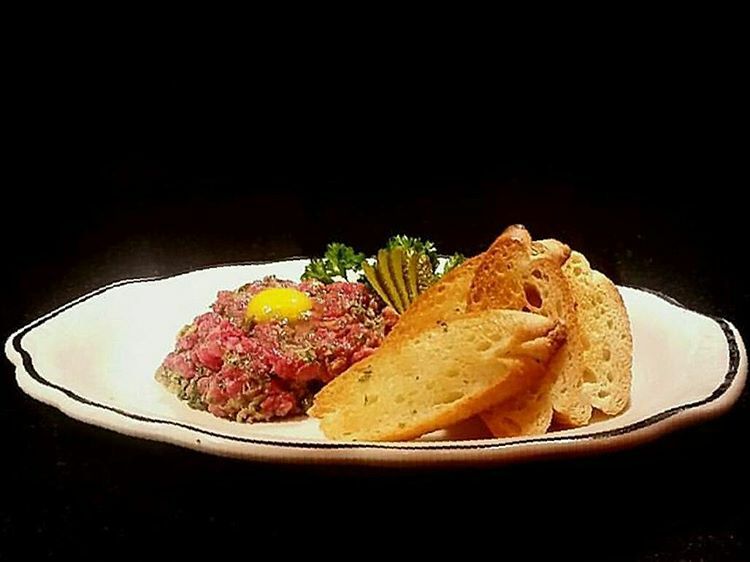 Upon your Friday arrival, head for the historic neighborhood of German Village for a casual dinner with drinks. 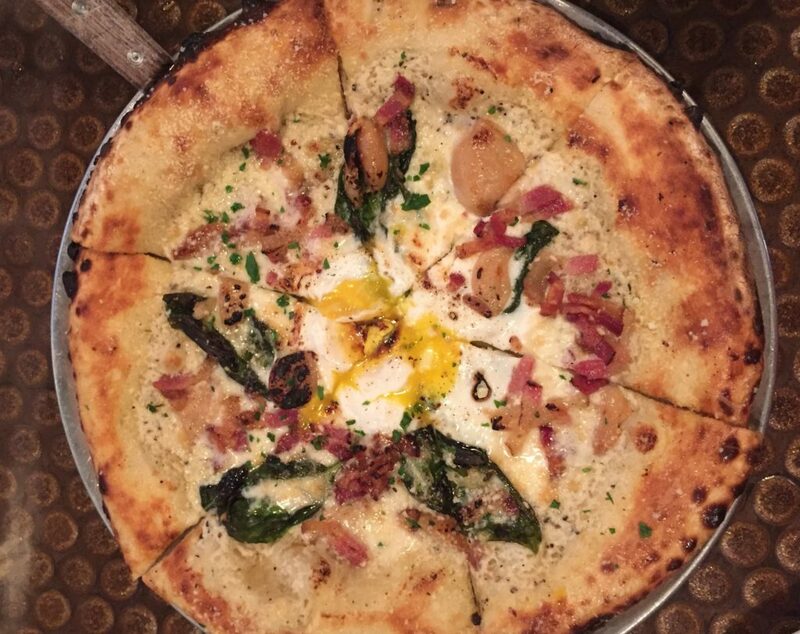 Harvest Pizzeria is the perfect place to unwind after the drive, followed by libations at its sister spot, Curio. The focus at Harvest is on local ingredients, and the pizza shines as a result. Don’t miss the Spicy Yuma pie, on a blackened and chewy crust topped with a chipotle-spiked sauce, corn, chorizo, roasted peppers, cheese and jalapeños. Add an optional egg on top and let the runny yolk ooze and enhance every bite. To fight off the heat, head next door to Curio for innovative Prohibition-era cocktails like a Silver Dollar Pony, swimming in bourbon and bitters. The next morning, venture over to Fox in the Snow Café for breakfast in Italian Village. 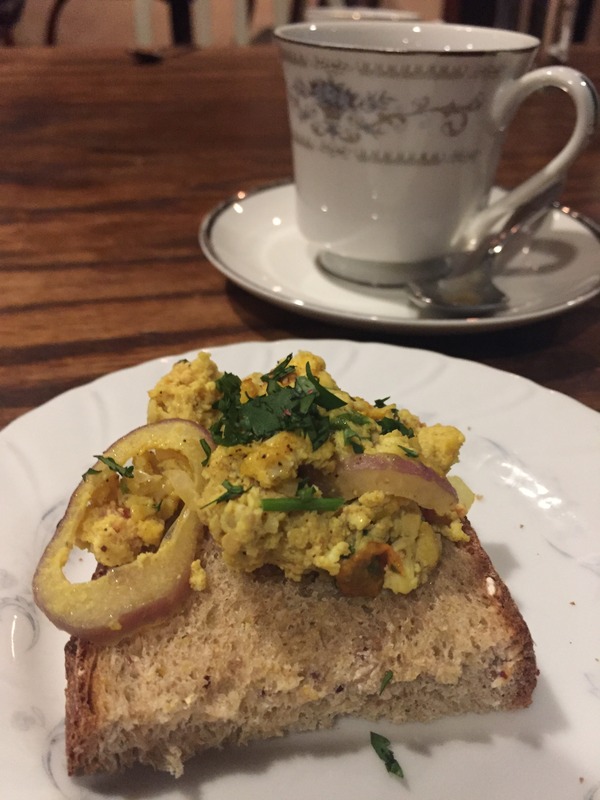 This newer spot boasts excellent pour-over coffee, tantalizing custard donuts, and an arugula-crowned egg sandwich that will have you raving. Make sure to get there early or you might miss out on some of the best of the baked goods. To stock your pantry at home, make North Market your next stop. 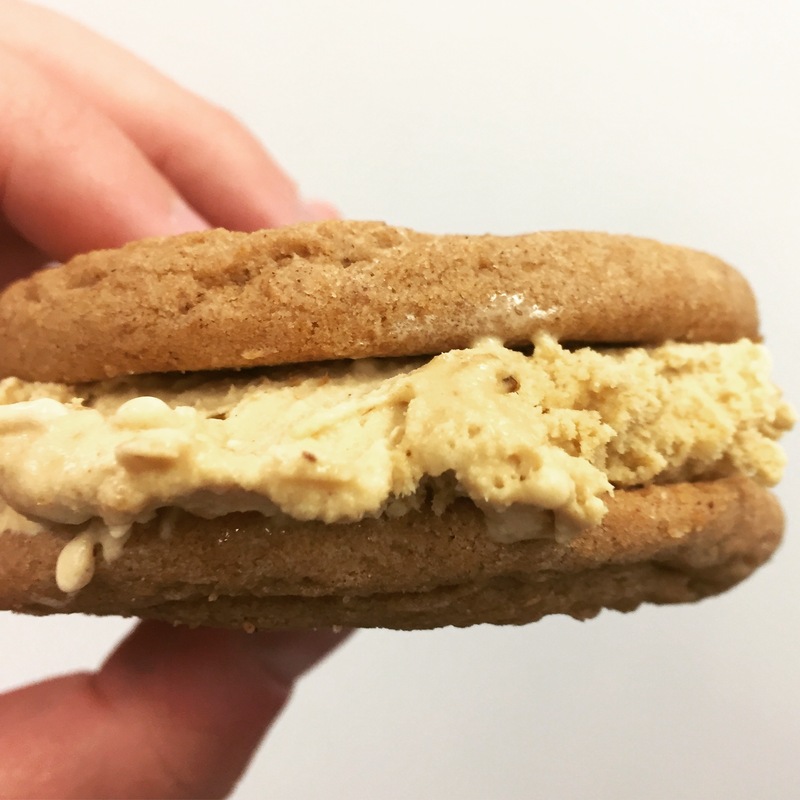 Here you can purchase everything from colorful macaroons to crusty marble rye, and it is also the best way to get a taste of Columbus for lunch. Hot Chicken Takeover is a personal favorite, specializing in fiery fried chicken and cool house-made ranch, but don’t forget about renowned Katzinger’s Deli Reubens, Brezel’s jumbo chocolate chip pretzels or healthy quiches from Little Eater. To enjoy a sunny Columbus afternoon, shopaholics can journey to Easton Town Center, an outdoor fashion mecca, while families and animal lovers can spend the afternoon at the award-winning Columbus Zoo. 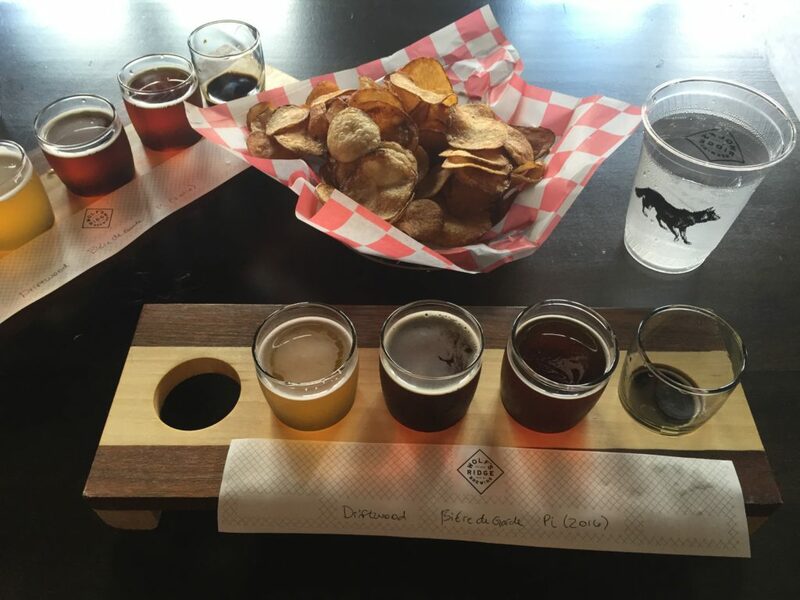 At dinnertime, there are many mouthwatering choices, but for road trippers Wolf’s Ridge Brewing is an easy winner. 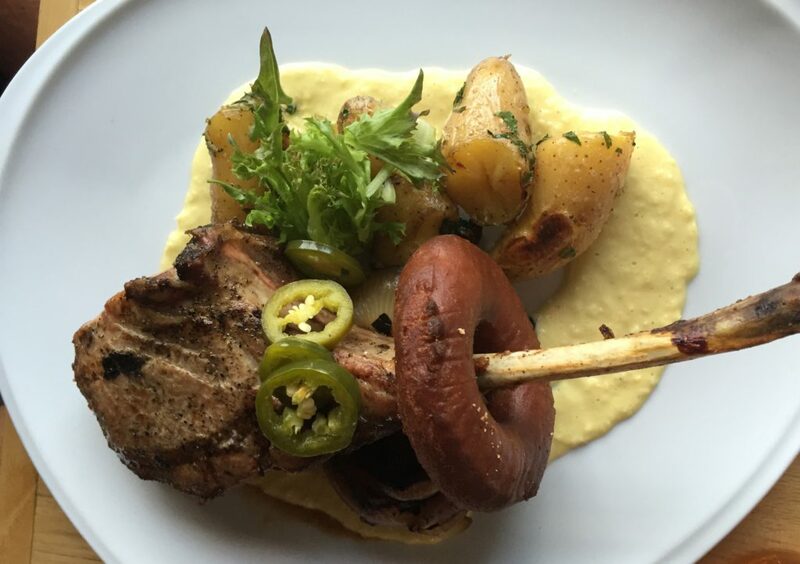 Such beautifully plated dishes aren’t typically found in a brewery, but this restaurant excels at both food and beer. The bright and modern interior is the perfect place to indulge in dishes such as corn bisque and scallops, all paired with craft brews in every imaginable style. 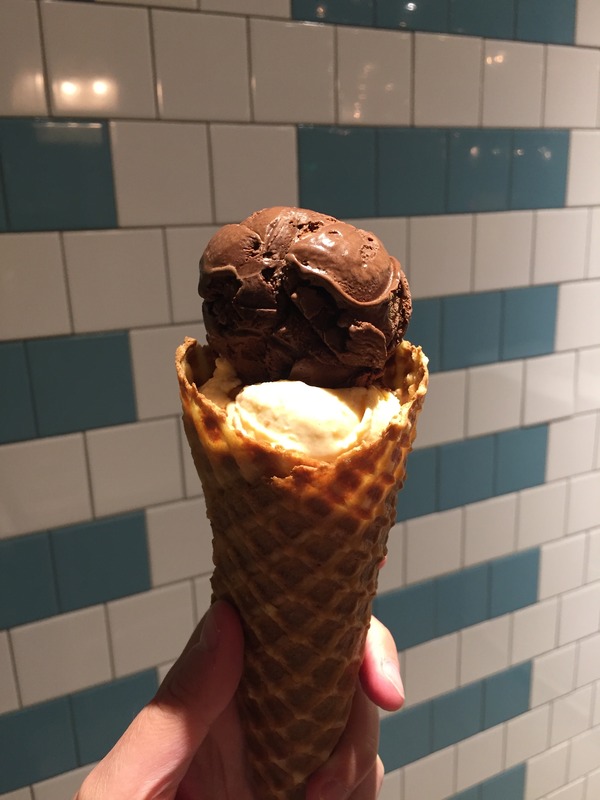 Banish your sweet tooth by heading to the area’s most beloved ice cream purveyor for dessert: Jeni’s Splendid Ice Creams. There are various locations around the city, so stop into the shop nearest you, and experience the wide array of seasonal flavors. Opt for the mini scoops to try all the varieties, like salty caramel, pistachio and honey, or biscuits and peach jam. Before leaving town, brunch at Katalina’s Cafe is essential. The Breakfast Tacos and the sweet-and-spicy glazed bacon are fabulous, but the must-try items are the pancake balls. Plump nuggets of pancake batter are filled with your choice of Nutella, dulce de leche caramel or pumpkin-apple butter, and these bites are ready for dunking in maple syrup. 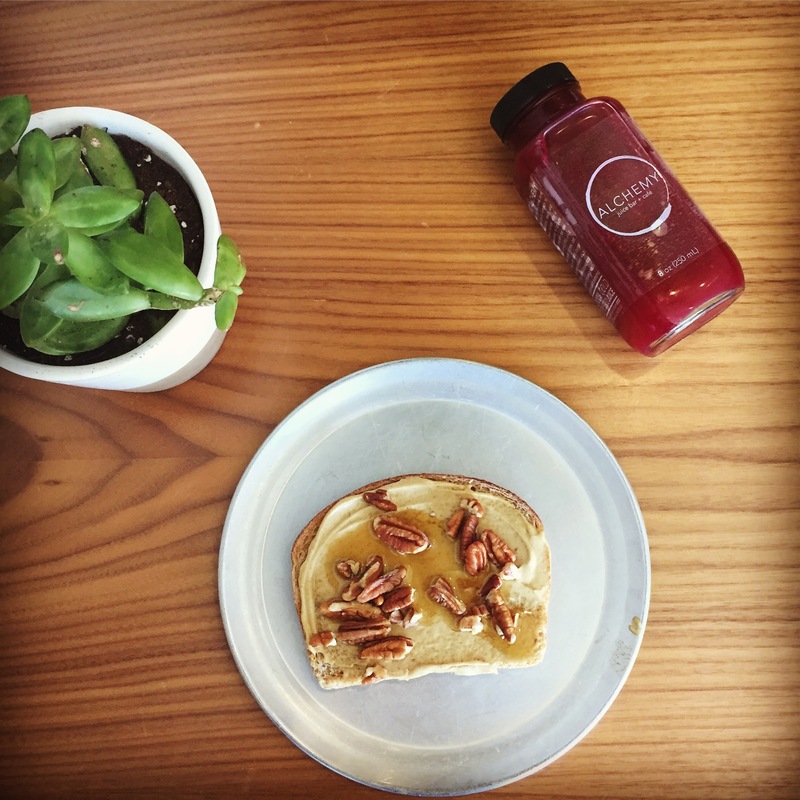 Fresh-squeezed juices and hot coffee will help kick-start your day, and the umbrella-filled patio laden with picnic tables make for a cozy morning experience. Katalina’s alone is worth the journey to Ohio. With its short distance from Charleston and wallet-friendly lodgings, Columbus is the ultimate road trip destination for local foodies.